John Patrick Shanley's play, DOUBT, last year won prizes on Broadway for its writing and acting. 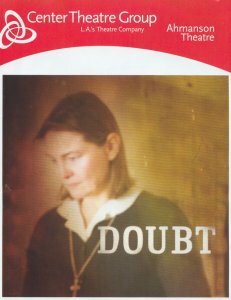 Now on national tour, DOUBT recently checked into the Ahmanson Theatre for a five-week run. The four-character drama set in a 1964 Bronx Catholic high school was a little lost in the cavernous Ahmanson, but its power still managed to come through, thanks to Shanley's compelling text, Doug Hughes' strong direction, and the actors' bravura performances. Cherry Jones stars as Sister Aloysius, principal of the high school and a grim, dogmatic, loveless woman who is convinced (without any proof) that Father Flynn (Chris McGarry), a priest on her staff, has been molesting one of his students (who just happens to be the only black kid in the school). Sister Aloysius also resents Father Flynn because he is a modern, charismatic and liberal priest, popular with the students, representative of the "new," ecumenical Catholic church. Showing an iron will, a ruthless determination to root out evil (all in the name of protecting her flock), she seeks to have Flynn outed and fired. Flynn is an equally strong and combative antagonist, which is of course what makes for good drama. The confrontation scenes between them crackle with urgency and tension. Caught in the ferocious verbal cross-fire are the young, idealistic Sister James (Lisa Joyce) and the black student's mother, Mrs Muller (Adriane Lenox). Shanley doesn't try to solve the mystery of Sister Aloysius' charges against the priest, settling instead for a shocking--or is it liberating?--admission on her part that, for the first time in her life, she might have been wrong about something.